Entering qualifying for the 2011 Korean Grand Prix, the Formula 1 arrives at the fourth to last event of the season with a drivers championship already wrapped up by a superior performance by Sebastian Vettel all year. Vettel and the Red Bull-Renault have been the superior combination in the 2011 Formula 1 tour. While the Red Bull Racing team has taken pole in every event up to this weekend's Korean Grand Prix qualifying, the squad with pilots Sebastian Vettel and Mark Webber were surprisingly not at the top of the time sheets during any practice session entering the time trial session at the 5.615-kilometer Korean International Circuit. Enduring a slick track during two Friday practices, a third and final tune-up session on Saturday morning finally gave the Formula 1 drivers and teams a chance to lap the Korean International Circuit under dry track conditions on Pirelli tires. Ready to take the fight to Red Bull Racing, the McLaren-Mercedes cars of Lewis Hamilton and Jenson Button emerged as speedy on slicks Saturday morning. Also taking an large advantage in the second practice session Friday in the wet, the McLaren team appears to have found not only the ability to keep pace but to outpace the Red Bull-Renaults. Readying for qualifying, Hamilton and Button would have to break the undefeated streak of the Red Bull bunch for the top grid position for Sunday's Korean Grand Prix. Lapping the track about 11 seconds quicker than in the Friday practice on the saturated surface, 23 of the 24 cars recorded times for their starting position with Daniel Ricciardo being the odd driver (driving for HRT, Ricciardo has been allowed to start the Korean Grand Prix with the Formula 1 stewards consent). Immediately in Q1, the McLaren-Mercedes cars sent a message to the entire field including Red Bull Racing that they wanted pole for this second ever grand prix held on the Korean International Circuit. Lewis Hamilton set the top time in the first qualifying session ahead of his McLaren teammate with a 1 minute, 37.525 second lap. In third place with the Russian drive Vitaly Petrov piloting his Lotus Renault GP car around the Korean track 8/10th of a second slower than Hamilton. Through the early stage of qualifying, the Red Bull Racing team have indicated they have been saving their soft compound Pirelli tires in order to have spare sets available during race day. In Q1, Sebastian Vettel was 9th fastest with Mark Webber 10th quickest on track. Both drivers added some pace on the Korean International Circuit through Q2 in order to safely maintain one of ten spots for the final Q3 session. Repeating his reign at the top in Q2 in Korea, Hamilton bettered his top lap time by a shade under 1 second faster than his previous best. In Q3, Lewis Hamilton delivered a best time trial lap early in the final qualifying group with a 1 minute, 36.160 second effort in the McLaren-Mercedes. With the Red Bull Racing cars bracing for a last moment attempt to steal pole in a similar fashion as the Japanese Grand Prix qualifying, the McLaren cars of Jenson Button as well as Hamilton launched a preemptive strike for fast time. While Button was able to beat Hamilton's previous best time, Hamilton lifted the benchmark with new performance of 1 minute, 35.820 seconds around the 5.615-kilometer track. While the Red Bull Racing team attempted to knock Hamilton off the pole, the team's best chance with Sebastian Vettel was roughly 18/100th of second short. Starting second Sunday, Vettel did beat Jenson Button setting the second McLaren-Mercedes in the next starting row for the grand prix. Dethroning Red Bull Racing, Lewis Hamilton and McLaren ended what was a 16-race streak where the blue Formula 1 cars started on pole position by either Sebastian Vettel or Mark Webber. The last time was the 2010 Brazilian Grand Prix when Williams F1 took a surprise win in qualifying. Mark Webber starts fourth in the Korean Grand Prix in the second row with Button keeping the rival teams of Red Bull Racing and McLaren in possession of the top four grid positions starting the race. In the third row, Felipe Massa gained an advantage on traditionally faster Ferrari teammate Fernando Alonso. Alonso was the winner of the wild 2010 Korean race. Nico Rosberg took 7th fastest at the end of qualifying starting alongside Lotus Renault GP's Vitaly Petrov. With Sebastian Vettel acclaimed the 2011 Formula 1 World Champion after amassing a considerable points total with four races remaining in the season, the focus on the final races in the grand prix racing tour has changed. While Vettel's team Red Bull Racing is still fighting to lock up the lucrative constructor championship for this season, the battle in the final races of the Formula 1 season is likely to see drivers take each event more aggressively as the 24-car field takes on the Korean Grand Prix this weekend. This case is especially so for Jenson Button, Fernando Alonso and Mark Webber who are within a 16-point separation for the second place in the 2011 drivers' standing. 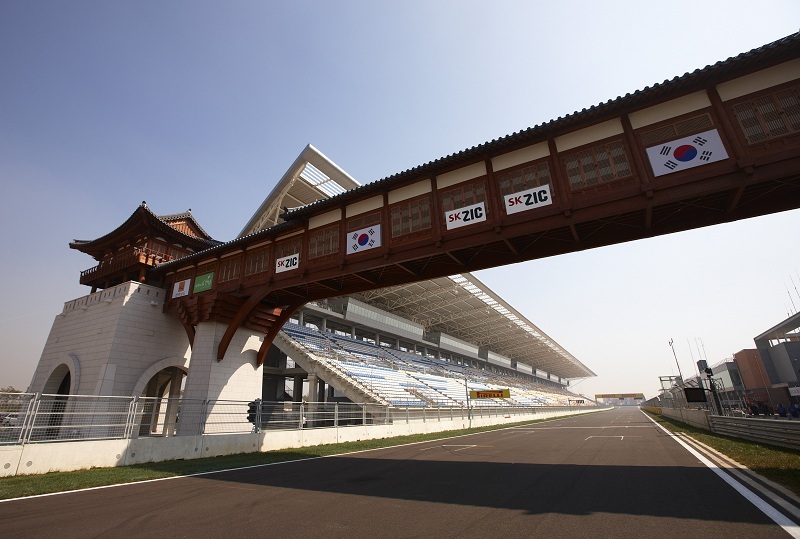 The Korean Grand Prix starts at 3PM local time (2AM Eastern time) under what is suppose to be a perfect sunny day.